Photo by Josh Drake | Texas House Rep. Matt Rinaldi (left) and Brookhaven College President Thom Chesney pose for a photo Oct. 24 after Rinaldi presented a resolution commemorating the 40th anniversary of the college. 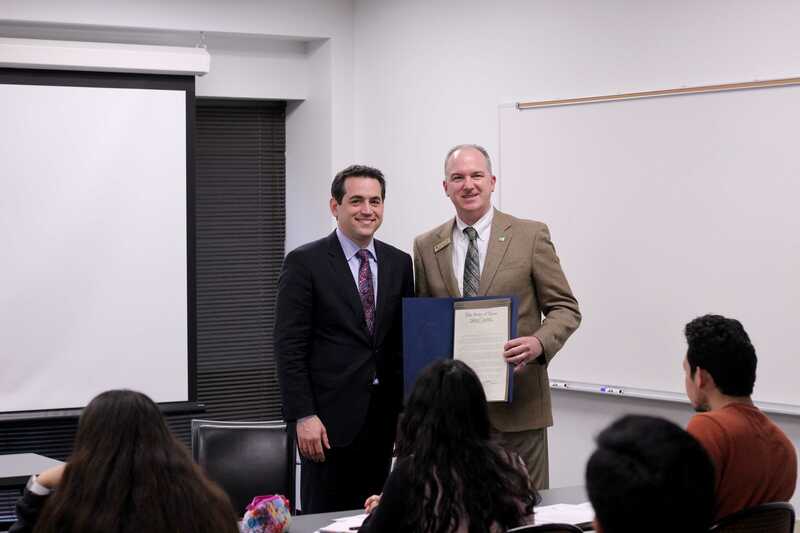 Texas State Rep. Matt Rinaldi visited Brookhaven College to present a resolution commemorating the campus’s 40th anniversary. He presented the resolution, which was passed in the Texas House of Representatives, during the Brookhaven Student Government Association’s general meeting Oct. 24. Brookhaven’s student body and faculty have grown steadily. Its continued growth is a testament to the pursuit of quality education ambitious students seek, Rinaldi said. He encouraged SGA students to continue pursuing their dreams and talked about the importance of voting and getting involved in politics. “Fight for what you believe in. If you want to help people, you can help people in so many different ways,” Rinaldi said to the students in attendance. Rinaldi started a career in politics because he wanted to do a job where he could help others protect their freedom, and that is what he tries to do in government, he said. He said the Texas House has added $4 billion to public education in the state. “We’re going to make sure we have the best education system in the country,” Rinaldi said. Articles in local publications, such as The Dallas Morning News and D Magazine, have painted Rinaldi in a dark light. Even his own Republican predecessor, Bennett Ratliff, has publicly shown his support for Rinaldi’s Democratic contender, Julie Johnson. Rinaldi said he feels even with all the negative things people have said about him, he will still have more supporters than he will detractors. Although he won the 2016 election by less than 2 percent of the vote, he said he is not concerned about those citizens being a part of the blue wave of anti-Trump sentiment. He said by running a stronger campaign this year, he believes he will come out victorious in the end.